Perhaps nothing is so hard to look at and value as photography. The ubiquity of the photographic reproduction, the infinite possibilities of photoshop and the blur between art and advertising has meant that art photography is less and less compelling. 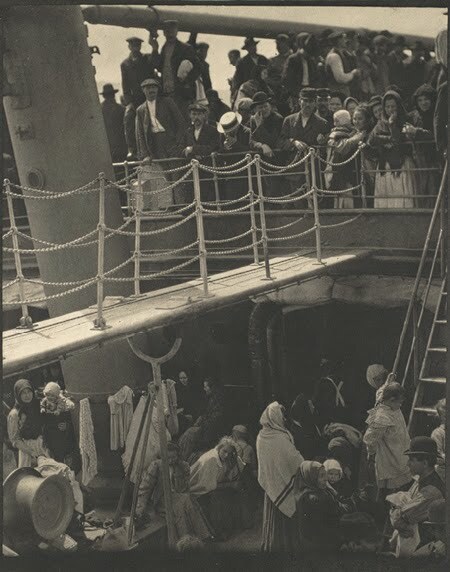 That makes an exhibition such as Alfred Stieglitz: The Lake George Years (worth a click for the excellent video introduction) at Sydney's AGNSW all the more shocking. A show that might have been of interest for its historical content, exploring the work of genuine pioneer, eschews trickery, celebrity and massive scale and delivers something quietly breathtaking. I didn't expect to have my prejudices about size and art reinforced here but they were. It's refreshing to see images so small and so perfect. Some of my nervousness about photography is in its easy default to massive prints that bludgeon the viewer. This monumental urge undermines an art form that has an enormous potential for intimacy. Intimacy is precisely what we see here. Fittingly the Stieglitz exhibition is situated a couple of floors above the AGNSW's abstraction show. Stieglitz uses the camera and film as neutral tools for expression, much of the work here is virtually abstract, tiny essays on light and dark and the music of nature. It's difficult to imagine how strange these images must have looked. Roughly contemporaneous with cubism and expressionism the earliest works here cut up urban America and arrange it in grids of silver grey and black. 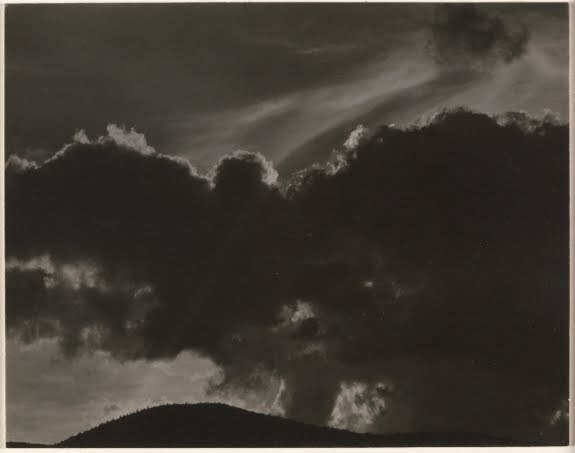 The studies of light and weather might be Stieglitz's most radical contribution to art. In painting they would be both impressionist and expressionist, in the context of photography they show how the camera could compose in light and form rather than simply record, that it could capture some of the sublime effect nature has upon us without simply describing it. These series, the 'Equivalents', 'Songs of the Sky' and 'Music' get close to the central paradox of photography: How does a technology that chemically records the fall and reflection of light on objects allow an artist to express their own vision? Stieglitz uses the light bouncing off and passing through clouds to turn them into abstract expressions, we don't see clouds as much as we see the shine and depth of greys that seems to capture the sublimity of nature. The cloud images are more romantic than they are meteorological. Stripping the images of earthbound reference Stieglitz relies instead on the way that the natural light interplays with the structural formation of the clouds. He isn't a child seeking familiar or anthropomorphic shapes in the skies rather he's exploring the possibilities of dark and light and how they might provide analogues for emotion and experience. This isn't stage set chiaroscuro but a sensitive play with pattern and contrast and how they might evoke something deep within the viewer. Photographic portraits have had a profound and disruptive effect on the painted portrait, what has been for centuries the core of art and patronage. 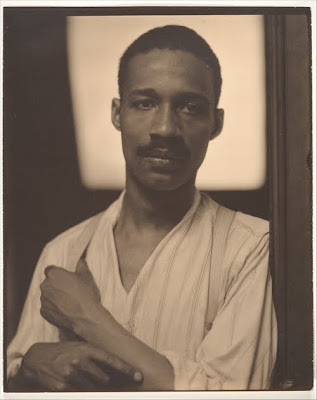 Stieglitz's portraits of friends and fellow artists show a restraint that's touching and rare today but, at the same time, betray the stylistic signatures of an auteur. These understated image often include a compositional element of a framing device, as shape or object, within the rectangle of the image and behind the sitters head. It's a simple device that borrows from the painted technique. The sitters head is isolated, we focus on the essentials. The effect also creates a perspectival link somewhere behind the sitter, so we can't help but feel Stieglitz has taken us into their space. But perhaps most touchingly Stieglitz has created a fragile halo, a remnant from an ancient tradition, behind these naked faces conferring on them some kind of modernist beatification. The series of studies by Stieglitz of his lover and later wife Georgia O'Keefe are stunning in the tender proximity between subject and artist. Taken over a period of thirty years they are a clear a melding of obsessive love and pictorial technique as any set of pictures, perhaps even those Bonnard painted of his wife Marthe over almost fifty years. 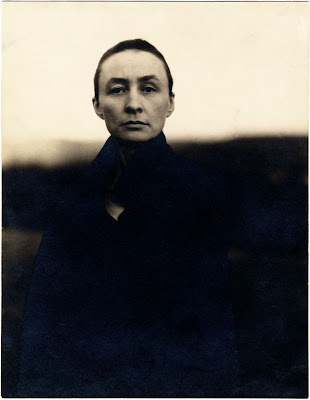 These photographs might be unique as the added frisson of O'Keeffe as artist/muse adds layers of possible meaning. O'Keeffe has suffered as have other female modernists, Frida Kahlo and Camille Claudel come to mind, from a feminist tendency toward hagiography that privileges biography over work. It's understandable but it lessens the impact of the artworks themselves and that's a shame. What makes the portraits of O'Keeffe so remarkable is that they feel so unmediated by culture, history or interpretation. It's a raw vision of an artist that is a meditation in flesh and geometry and light. When seen as a series these pictures are achingly beautiful, they paint a portrait of love and trust but their repetition also reminds us that Stieglitz, who can't of been short of sitters, was simply endlessly fascinated by his lover and wife. The portrait, from 1931, when they had been married for seven years, reduces the artist to her hands cradling a sun bleached cow's skull. 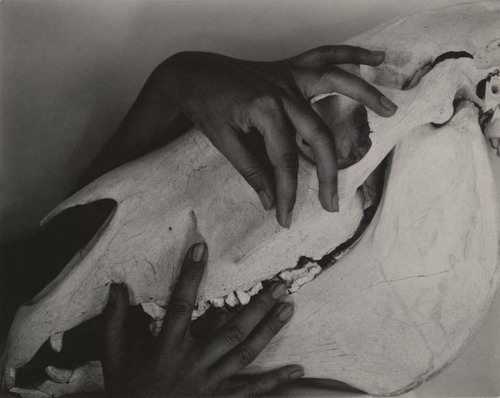 Of course that skull is a familiar and powerful motif from O'Keeffe's paintings but here it looks chalkier, like unglazed porcelain, as she cradles it in tanned hands. The skull serves as reference to both art and nature but most powerfully to the omnipresence of mortality, the way the hands hold it is almost an embrace, one doesn't need to understand the relationship between artist and sitter here to get a whiff of the complex and profound feelings at play. 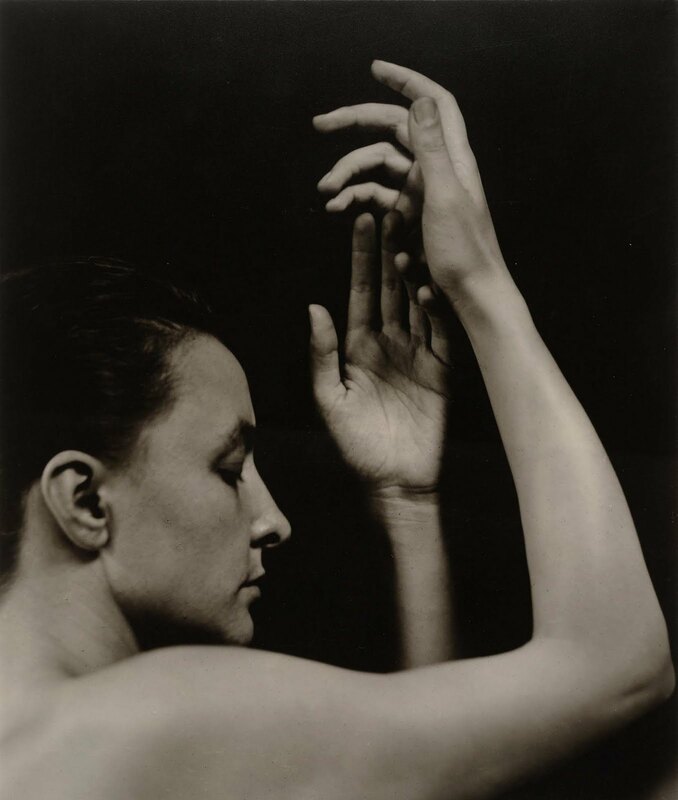 Stieglitz's intention is clearly to capture the essence of someone. 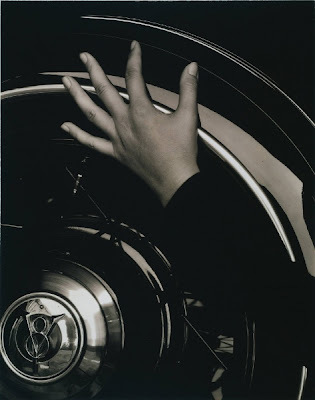 This makes his use of hands fascinating, they appear as body parts, almost abstracted, but they are always more than objects and retain the essential personality of their owner almost like ones voice. Hands and gestures are fascinating because we never perceive them as still, so even in a hundred year old photograph they seem to be captured at a point between movements. Similarly whatever this human essence is it has infinite manifestations, people are too complex despite what we might believe of an artist's powers and a single image will never suffice. Stieglitz is like someone chasing light around the facets of a diamond, he seems to know the best he can do is capture moments and angles in light. He uses O'Keefe's hands, her human geometry but never tries to reduce her, just to capture something fleeting. Many of these photographs, and in a sense all of them in their totality, are like haiku in gelatin silver. Stieglitz is too easily bundled in amongst a rush to the reductions of modernism and cubism, the time he inhabits and the new technology he is stretching make that almost inevitable. On looking at the images here it feels like a mistake to label him that simply. We can see hints of the abstract, the grids of Mondrian or the blocks of Braque, but his work is as human and as smudged as a fingerprint. 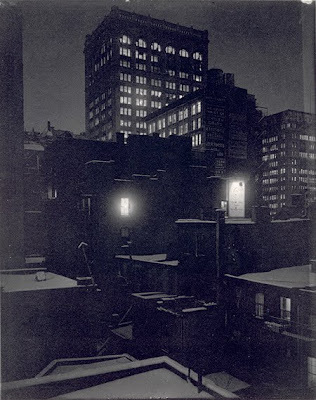 It is this sense of flaw and serendipity is what makes him so different to photographers like Man Ray for Stieglitz seems to embrace the beauty of imperfection. The memorable works here inhabit a world of infinite shining gradations between black and white, they are expansive and open rather than reductive and finished, in doing this Stieglitz's greatest innovation might be to take a static form and make it so intensely moving.